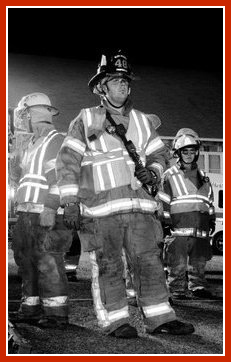 On Scene: On Duty with Michael, Firefighter. On Duty with Michael, Firefighter. I work in the Customer service department. My job entails many different things from giving customer updates on their orders, taking department orders, tracking orders that are coming from vendors, helping customers select the right product for the job they are trying to do and even just educating customers on the products and the product capabilities. I am currently in the fire and rescue side of the service and soon will be adding the medical side. I have been in the fire service for about 12 years now and have enjoyed every minute of it; the good, the bad and the ugly. I’m not sure there is one thing I love most about it. I think I just enjoy all of it! The sense of pride we have for our station, our equipment and what we do is part of it. I like the camaraderie we have as a firehouse with each other; there is something to be said for trusting your life with your partner. The work we do may be dangerous at times, but I love it. There is something so rewarding and fulfilling about helping a person in their time of crisis. Yes, I do enjoy it. What we do is a lot, but also a lot of fun! There is something fun about having that common interest with your customer and knowing what they are looking for so you can help get the product or service to take care of a specific issue they have. It has also allowed me to give an honest, real world review or insight to into a product we sell. This first hand knowledge has helped customers understand why I recommend a product since I actually have experience using them. It just gives you that much more credibility among customers which is very helpful when you are talking about investing into quality products. How have you felt your experience has helped you better aid our customers? Any specific examples? I do very much agree that my experience has aided my customers. In fact, I believe one of the reasons I am good at what I do is because I have the experience and can speak to the customers about the products with first hand information. Boots, gloves, hoods, helmets, and flashlights are the areas that I can really help a customer the most with my experience and knowledge of our products. I love to help them get exactly the product to suit their needs.